There is a vast array of different Linux distributions available for you to try out and use, and a useful thing most Linux releases have is they can be tested without affecting your Windows install. Just download a Linux ISO and burn the image file to CD which you can then directly boot from. More recently, installing Live Linux distro’s onto USB flash drive has become more popular and there are quite a number of free applications to help you do it. After installing the Live Linux onto USB, to test it you will have to boot up the computer using the USB flash drive (if it supports USB boot directly) and you won’t have access to Windows. 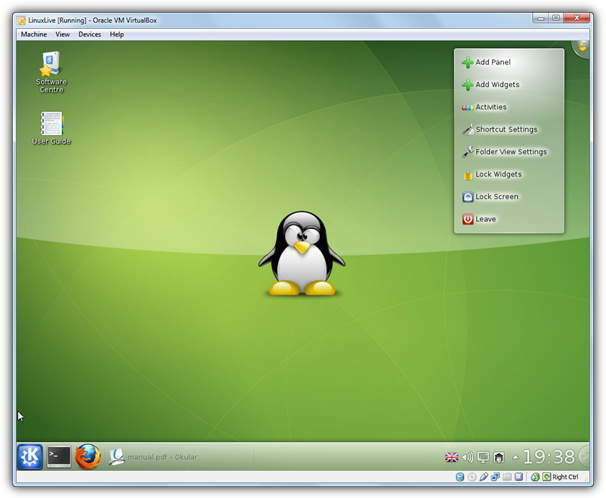 A way to test out Linux from within Windows is by using virtualization software such as VirtualBox to load the Live Linux into a virtual environment. VirtualBox is a great free program but can be a little too much work to install and setup if you don’t need to use it that often. 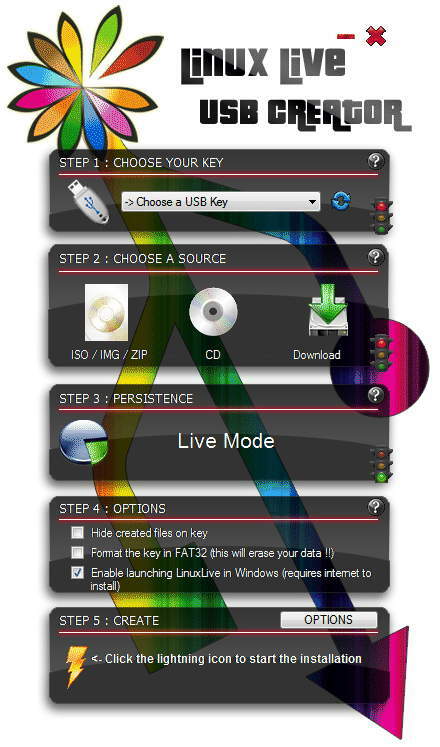 A free Windows application that can perhaps give you the best of both worlds is LinuxLive USB Creator (LiLi) which creates a bootable USB Linux, but also can include a self contained version of VirtualBox which runs directly from the USB drive. This means you don’t need to install or configure VirtualBox at all to run your Live Linux. LiLi has portable or setup installer versions available, so simply download and run the tool to open a pretty black graphical user interface set out as a series of 5 steps to guide you through the process. The first step is to choose your inserted USB flash drive. Make sure you use a USB drive and not an empty partition of your hard drive which you can also choose from the drop down list. For choosing a source, you can either select the ISO image, a Zip file or IMG file. There’s also the option of using a previously burned CD or a folder on the hard drive. The automatic option would be to press the Download button and select the Linux distro you want from the drop down list, there are several to choose from including some Linux based rescue / utility discs such as Hiren’s Boot CD and Ophcrack. On testing, some of the entries in the list were out of date and didn’t work as the latest version of LiLi, and therefore the list, is over a month old. Something to bear in mind although it can send you directly to the official page for the latest links. Persistence allows you to keep your preferences and data even after a reboot, and will let you install and update so 3rd party software. This option isn’t available on all Linux distro’s and doesn’t work in VirtualBox on Vista or 7. The Step 4 options are quite interesting and very useful. Hiding created files on your USB stick is really one of personal preference, and you get to also format the flash drive in FAT32 if not already formatted. The third option will allow you to run the Linux Live from USB using a portable version of VirtualBox. Checking this option will download the latest portable version of VirtualBox and install it onto your flash drive. Finally click the Lightning create button to start installing the Linux Live onto your USB flash drive. After installation is complete, you can either boot up the computer with your USB flash drive which will load the Linux live, or you can open the USB drive in My Computer, then run Virtualize_This_Key.exe from the VirtualBox folder to run Linux inside Windows using VirtualBox. LiLi supports hundreds of different types of Linux distros and Linux based utility discs and it provides a huge convenience to anyone who is interested in learning how to use linux, how to fix unbootable windows computers using rescue CDs, or even learning how to hack wireless networks such as backtrack. As a standalone Linux to USB creator, LiLi is useful but not too different from similar tools. But with the built in virtualization feature, LiLi becomes a very valuable tool to have around. It works on Windows XP, Vista, 7 and 8. I’ve using LiLi for over 6 months, and it’s easy step make me love to it… Only in few mouse clicks you can enjoy the Linux Live USB. great application and i just want to try this one for me to know the program very well. keep up the good work raymond. great post. definitely going to try it. Linux rule! Thank you raymond, Very helpful post..
this takes the pain out, without rebooting or using virtualbox!